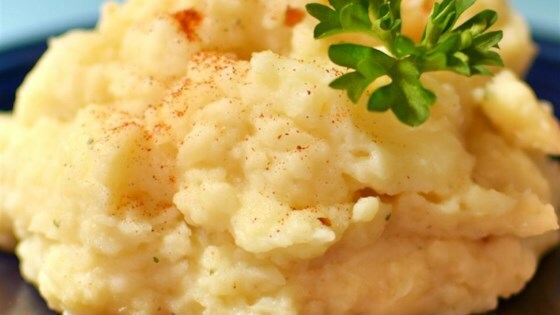 "We couldn't find a mashed potato and cauliflower in the slow cooker recipe, so we combined several recipes into this one." Combine potatoes and chicken broth in a slow cooker. Cook potatoes on Low for 3 hours. Add cauliflower and continue cooking on Low another 3 hours. Stir milk, butter, sour cream, black pepper, garlic powder, paprika, and salt into the potato mixture. Mash with a potato masher or blend with an immersion blender to desired consistency. Continue cooking until hot, about 10 minutes more. Great way to get some extra veggies in your meal. I used red skin potatoes and didn't peel them. This was good and a great way of adding extra veggies into a meal. I had mine along side some corn and stuffing. It was the perfect accompaniment and it was easy to make. Thanks! This is a good recipe only it takes too long. I didn't have time for the slow cooker so I did it the old fashioned way on the stove and it tasted excellent.